Choose the front and back of each swing. 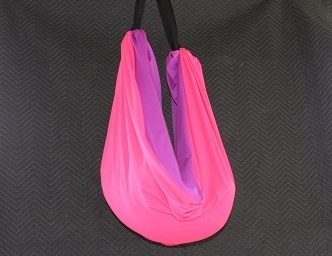 Our Spacial Autistic Swing is double layered lycra and has a 2 inch wide webbing loop on each end. 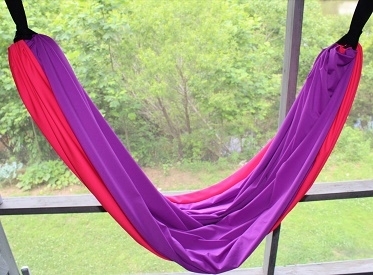 You can use the swing as a single connection point or as a double connection point as a hammock. 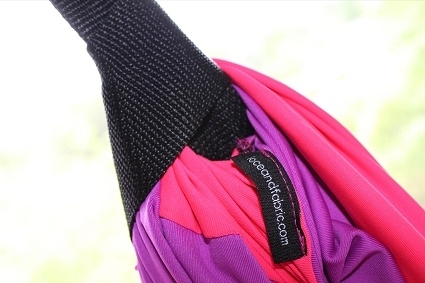 Many of our competitors' swings are single layered thin fabric and use 1 inch webbing. If you look closely at their pics you can actually see through the fabric. We supply Hospitals, occupational therapistsa and special needs schools that use the swings when working with autistic children that have sensory issues during therapy . If you would like to order with a purchase order please contact us. We undestand the importance of finding that perfect color for children with sensory issues. We give you the choice of many colors. You can choose the front and back color of the Spacial Swing. We custom make all of our swings from fabric made in the USA. 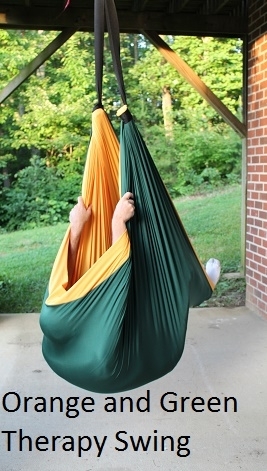 The Therapy Swing gives children the experience of being in cocoon. 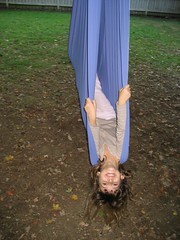 The lycra Spacial Swing can be suspended from either a properly installed ceiling bolt or swing set. Many customers also use it attached to a tree sturdy tree limb. Stretchy material provides enough resistance to allow children to bounce and move, or just lie still. Designed with children in mind the swing works well up to 150 pounds. Great for physical therapists or OTs as well. The swing gives children with autism the pressure for a variety of therapeutic uses. The Spacial Swing provides vestibular input, with increased deep pressure providing a calming effect. 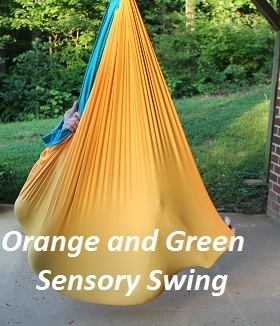 This swing is great for developing body awareness and addressing motor planning skills Made of 2 layers of heavy duty four way stretch Lycra, this swing provides varying degrees of resistance, layer by layer. A definite must-have for any therapeutic setting. The Spacial Swing's unique design of heavy stretch fabric give deep tissue pressure. 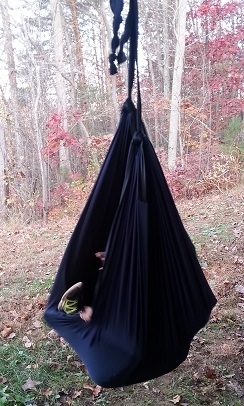 The Spacial swing gives a cocoon like feeling where you are in your world. It is also great for spinning around. You can purchase the rotation device to spin around or you can spin the swing around and let it ago. You can see in the video below where it is done and the swing spins around. Adults supervision is important when using the Spacial Swing. 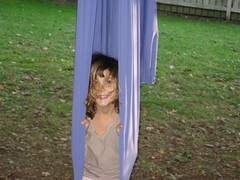 After moving or resting in an lycra swing a child can feel more alert, relaxed, and energized. To adust the height you can adjust the the knot in the webbing to raise or lower it. Proper installation of the eye bolt is important to the safety of using the Swing. A forged steel eyebolt properly bolted into your ceiling support structure is recommended. We Recommend buying a forged eyebot that can hold 1,000 pounds. To Set up hook the Caribeaner to the Eyebolt and then to the rotational device, then hook both sides of the Spacial swing's webbing through the other caribeaner and hook it on the rotation device. Making sure that both caribeaners are clicked close. Ceiling heights are recommened from 7-8 feet high. The swings stretch and can be used on 8 feet high beams with a weight limit of 150 lbs. We make each swing if you have a lower ceiling contact us and we can alter the swing. Swings are shipped out 2-3 days after placed. The ceiling support you put the swing onto must be able to hold at least a 1000-pound load. The swing when set up should be at least six feet from any obstruction. You should use eye bolts not wood screws. Eyebolts that screw into wood could back out when spinning and could lead to an accident. . When everything is set up you should check the wear and tear on the swing. Over time metal can wear thin and webbing become frayed. If you see these problems after regular inspection have it fixed or replaced.